Upon finishing my MSc in level design for games I had reached the point that the pipeline I developed had been tested on a game project, the outcome of which can be seen in a separate post. 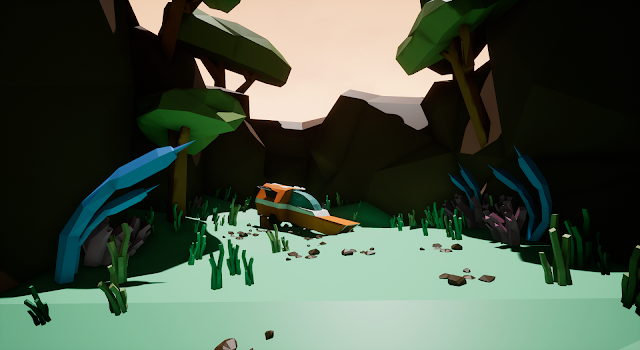 However in order to prove the pipeline works for a fully functional and finished game I have began work on my game 'Landfall' which is being created in UE4. This is intended to be a small game project and should last about 20 minutes spanning 3 levels with multiple paths and routes through the level. The core design behind this game is the to encourage exploration and adventure in the player. Inspired by titles such as Metroid and No Mans Sky, I am trying to present the player with a new and weird alien world to explore. By exploring and navigating the planet the player will be able to uncover the secrets which are hidden in the world. This will involve some simple combat with the native species but it is not intended to be an action game. In order to make a game rapidly over the course of a month I knew I needed to go for a more stylistic approach to the artwork. I decided a low poly and faceted style would be simple, effective and also pretty and fun to implement. Using scifi artwork from the 70's as reference I decided on the colours and visual style. I chose muted and pastel colours to represent the scene as I have always enjoyed the softness and relaxed atmosphere they created. Using Blender as my core asset creation tool, I begin creating each of the models using basic primitives. These are adapted and manipulated to triangulate and decimate them to make them match stylistically. The narrative of this game has been created to be as implicit and in world as possible. The story is mainly told through the use of an in-game scanning device which allows the player to locate strange lifeforms and historical objects and scan them to add them to their ScanLog. By seeking out and scanning all of the hidden objects and creatures in the world the player will be able to uncover the mystery of what has happened to this planet and how to escape. I am an artist and independent games developer focusing on 3d art and level design. I am based in the south coast of England and am an MSc & BSc University of Portsmouth Computer Games Technology course.